Italy is a person that can be annoying sometimes even without realizing. He really tries to make a good second impression because theres a very high chance that he'll mess up the first one by being obnoxious or rude, He doesn't mean to do this, it just happens. Even though he loves to be around his older brother Romano, his brother doesn't seem to like him very much. This makes Italy sad, because he really does like his brother. His relationships with other nations vary. He gets along well with some, the less strict more easygoing countries, and he just gets on the nerves of others, the well organized groups. One of his favorite things to do is cook pasta and he loves to impress girls with his cooking skills. His best friend is Germany, even if Germany can be a bit harsh and hurt his feelings sometimes. Italy always seems to recover from these "blows" very fast. 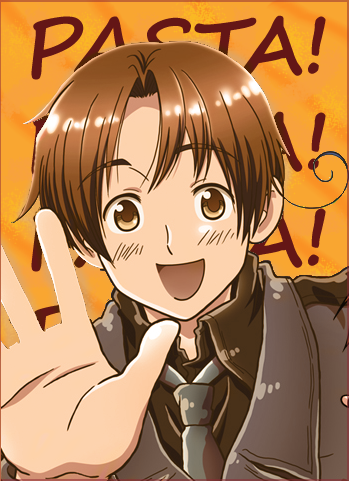 Overall Italy is the type of character that, while he may seem a bit overbearing at first, grows on you very fast. You learn to love him after a while. "What! What is it?! "Germanys stock greeting when Italy was aggravating him, "Ve… ve… I forgot…"Italy was usually this forgetful, but it was uncharacteristic when the news was as important as it was now. "I'm hanging up no-" Germany began to say, obviously annoyed, when he was cut off. "No! Don't go! I'll remember it in a second, I promise"
"Ve… How was your day?" "I had to stay here for that"
"No! "Italy said defensively "I was just asking…"
"Well then…I've been pretty good, I guess"
"Good!" Italy said just as he remembered what he was telling Germany "Ve… what I was telling you was that I found a wonderful new kind of pasta! Would you like to try it some time?" The italian said cheerfully. "WHAT!? YOU CALLED ME WHILE I WAS BUSY JUST TO TELL ME ABOUT PASTA AND WASTE MY TIME!? "The German roared. "Ve…. No…I just called to tell you about pasta. Not to waste your time!" "Please hang up before I hurt you"
The italian did as told, but really hoped Germany wasn't serious. Then he forgot all about it when he cooked himself some of his new pasta. It was delicious. Hey, hey! It's an Italy app I spy! You're almost there! Just a few things and then you'll be all set. If you have any questions, feel free to ask for a few hints here and there! RP Sample: Just be mindful of your spacing and grammar. If English isn't your first language, that's fine. If you need help, feel free to ask. Okay, something slightly nitpicky is to just double-space your paragraphs if you can (like my response to you), but you don't have to go back for that now. Anything Else: You're missing something that belongs here. Be sure to go and re-read over the Forum Rules again, just to make sure you have everything! MSN Account: You're also missing your MSN Account, so please add that as well. You'll still have until your application is due to make the changes. If you need an extension, please let me know and you'll get one. Make the changes to at least the Personality Section, Anything Else section, and add your MSN Account and then I'll take another look at your application. Good luck! Now that you're accepted you can upload a user image. You can post more about you, the RPer in the Introductions Thread. We'll have our resident chat mod add you to the MSN chat so you can join in the randomness there too. Feel free to start browsing the worlds and start working on profiles and plotting~!